Want to become doctor or medical officer in Army, Air Force or Navy? Read on to know the eligibility, how to apply and last date of SSC officer posts of Army Medical Corps. Are you MBBS doctor or about to finish internship in March and want to join Army Medical Corps? Indian Army has invited applications for 200 vacancies of Short Service Commissioned officer posts. Army Medical Corps is one of the ace medical establishments of India. It recruits MBBS holders every year for medical officer posts in defence services. Recently, AMC has released notification through which it is about to recruit two hundred MBBS doctors. Working in defence forces as a medical officer will give you a good exposure and one will work in state-of-art technology. Candidates fulfilling the following conditions may apply for Short Service Commissioned officer posts in Army Medical Corps. Applicant must have passed MBBS or should be completing his internship by March 2013. Applicant must have passed MBBS in first or second attempt only. Applicant must have permanent registration in MCI/state council. Applicant's age must not be above 45 years as on 31 Dec 2013. MD/MS/MCh/DM holders are also eligible to apply. There are total 200 vacancies available in Army Medical Corps. Maximum doctors will take up their career in Indian Army as medical officers. Few doctors will be commissioned as medical officers in Indian Air Force and Indian Navy. All eligible candidates will be interviewed at Research and Referral (R&R) hospital located in Dhaula Kuan, Delhi Cantt. by a Board of Officers. If the board considers that the candidate is suitable to be commissioned in Indian Armed Forces, he will be selected. Shortlisted MBBS doctors by Army Medical Corps will be commissioned in the rank of Captain or its equivalent rank. Salary of a captain in Indian Army will be approximately 70000 per month. Take a print out of application form of Army Medical Corps SSC officers in A4 size paper. Fill up all details and send the applications to the following address. 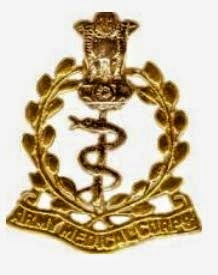 Last date to apply for Army Medical Corps Short Service Commissioned Officer posts is 28 February 2013.